Enchanted Air Paragliding, LLC. provides USHPA certified Paragliding instruction and lessons as well as Tandem Paragliding Flights. Our school is certified by the Professional Air Sports Association (PASA). Come learn to fly Paragliders in Albuquerque with Enchanted Air Paragliding. Serving all of New Mexico and the Albuquerque area. Our comprehensive lesson and instruction programs cover practical flying skills coupled with theoretical knowledge of aerodynamics, micro-meteorology, airmanship and flight laws for beginning to advanced student pilots. 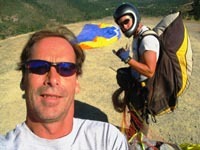 Your journey into the incredible sport of paragliding will be led by Chuck Woods, a USHPA Certified Advanced Instructor with over 40 years of hang gliding/paragliding experience, and the only local paragliding instructor in Albuquerque certified as a Tandem Instructor and Tow Observer by the USHPA. With Chuck’s patient guidance, you will safely learn equipment fundamentals, proper ground handling, training hill and high altitude flying all under radio instruction as you progress to achieving your first high altitude soaring flights. Provided year-round, our lesson packages include an introductory through all-inclusive training curriculum that will give you the skills needed to achieve your USHPA P-2 Novice rating. With proper instruction, you also need the proper equipment, and Enchanted Air Paragliding is a one stop shop for some of the most reputable paragliding equipment manufacturers in the world. We provide sales of wings, harnesses, and accessories from leading manufacturers such as Ozone, Swing, Nova, Gin, Niviuk, Advance, Skywalk, APCO, Icaro and Flytec to name a few. All students receive deep discounts towards purchase of equipment including wings, harnesses, reserves, and instruments. Check out our equipment page for further details. Experience your dream of free flight by learning to fly Paragliders with Enchanted Air Paragliding by contacting us today! There's something for everyone in our online store at Cafe Press. Tee-shirts, caps, coffee cups to thongs, get a unique gift for someone special today! Also check out our high quality embroidered logo apparel at our Queensboro online store! Copyright © 2019 Enchanted Air LLC. All Rights Reserved.